At Bakewell Town & Community Trust we believe that the Town Hall is part of the community. That’s why we are working hard to provide facilities and activities to suit a broad range of users. We offer a special reduced, community rate for local community groups and charities to ensure that we remain at the heart of Bakewell. Our current users are wide ranging and we want to welcome new groups, so we’ve made considerable efforts to improve accessibility. With the improvements we’ve implemented Bakewell Town Hall can provide rooms for hire with quality facilities for both small and large user groups. We have three rooms available for hire. 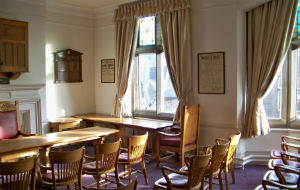 Our smallest is the Bakewell Town Hall Council Chamber on the first floor, still used by the Town Council today. It can seat groups of up to 20 people comfortably and in some style. The Council Chamber is accessible by lift from the ground floor. The Bakewell Town Hall Assembly Room Theatre is our largest room for hire and can accommodate up to 200 people for a dance, or theatre layout to seat 165. As you can see in the photo to the right the Assembly Room Theatre has a large stage set behind what’s known as a proscenium arch. There’s also a lighting rig, making the Assembly Room Theatre a great venue for theatrical presentations and concerts. The room also boasts a sprung dance floor making it the perfect choice for staging an event where dancing is on the menu. Talking of food, the Assembly Room Theatre has direct access to fully equipped catering facilities and we also run a fully-licenced bar. Although situated on the first floor, the room is accessible for all as we have a lift for those who can’t quite manage to ascend to this magnificent room via the grand staircase. 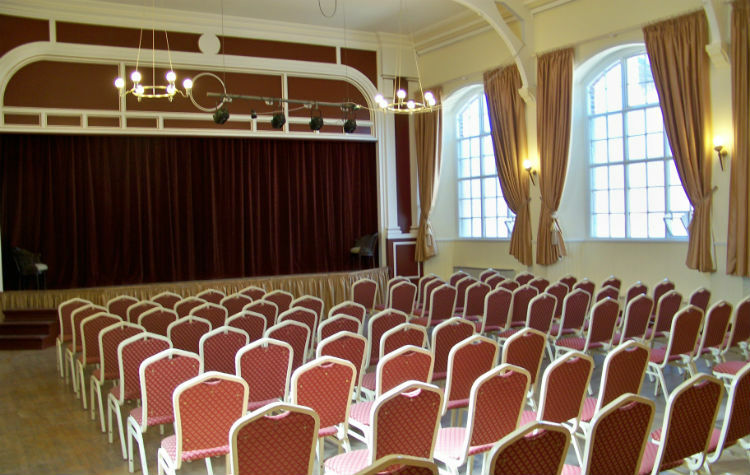 The Bakewell Town Hall Assembly Room Theatre is a perfect venue for a range of events, from parties and sales to educational classes or business conferences. Why not give us a call and make an appointment to come and view. We’re confident that you won’t be disappointed. Call us on 01629 810152.